Lefranc Chiropractic (Sandy Springs) - Book Appointment Online! 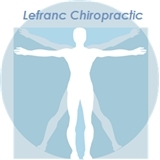 Lefranc Chiropractic is focused on providing high quality service and patient satisfaction for a variety of muscular, skeletal and nerve related issues resulting from auto accidents, work injuries, personal injuries, sports injuries, everyday bodily wear and tear, and issues of unknown causation. Here are just a few of the symptoms that Dr. Lefranc specializes in treating...neck pain, back pain, headaches, joint pain and stiffness, muscle pain, TMJ pain, postural abnormalities, problems with balance, neurological issues such as radiating pain, numbness, tingling, and more. Rest assured, we are dedicated to meeting your expectations. We offer a diverse variety of Chiropractic Techniques and PT modalities in order to be specific in helping you improve your health and well being. Thank you for choosing us for all of your Musculoskeletal and Neuromuscular needs.